For the purposes of this website, we have had to split the properties into sections to make the menus practicable. The WEST side covers those properties on the right when travelling from The Plain towards Bristol and the EAST side covers those properties on the left side. Odd numbered properties 1 – 81 High Street are on the East side. Even numbered properties 2 – 66 High Street are on the West side and these include the Methodist Church, old fire station, register office and the old Market House and old Toll House both of which are now part of 14 High Street, and Rosemount which is at the Bristol end of the street. It is interesting to note that the rear of the properties on the west side effectively form the boundary of the town. 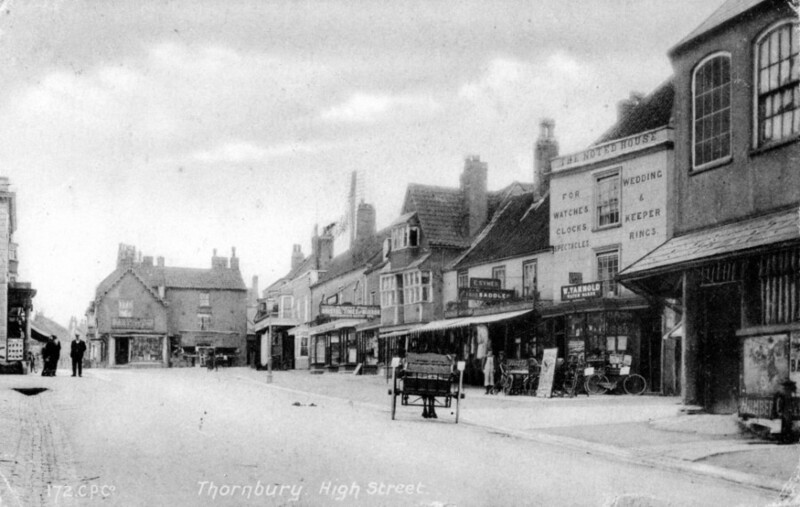 However many of the older documents (such as land tax records) relating to the properties from 2 to 26 High Street show they were in the Tything of Kington and they are often missing from lists relating to the Borough of Thornbury.